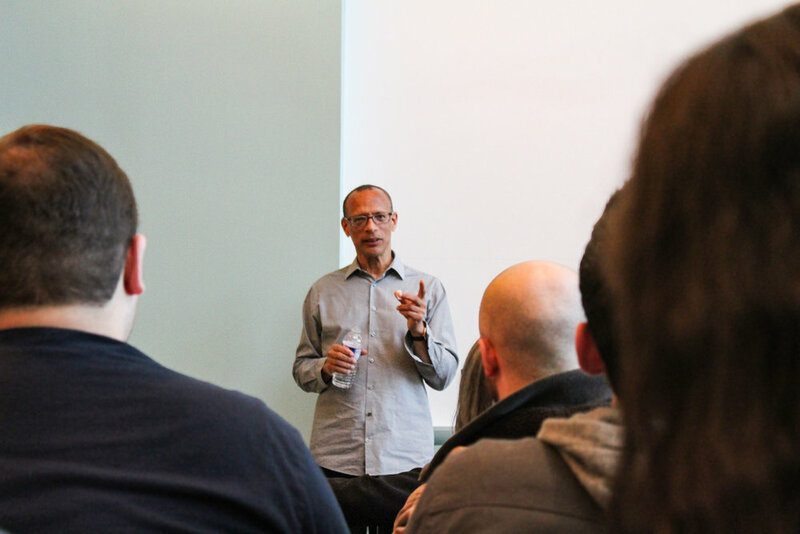 Poet, playwright and novelist Fred D’Aguiar (pictured above) gave a reading in the Doty Tower Room on Wednesday March 27. D’Aguiar spoke about his experiences with writing, especially on topics related to tragedy (Madelyn Dewey/Arts and entertainment editor). Yet another brilliant writer visited Geneseo and captivated an overcrowded room with beautiful words that left an incredible message. The semester’s second literary forum reading on Wednesday March 27 in the Doty Tower Room featured author Fred D’Aguiar. Associate professor of English and creative writing Lytton Smith introduced D’Aguiar, who has had many plays, novels and poetry collections published. He summed up D’Aguiar’s effort to bring traumatic past events to life and require action to fix society’s ongoing problems. Much of D’Aguiar’s work is based on traumatic historical events, like slavery and mass shootings, and highlights the suffering people—mainly black individuals or other victims of systemic violence—have experienced. D’Aguiar first read an excerpt from his novel Children of Paradise published in 2014. The novel draws from the horrors of the Peoples Temple Agricultural Project, commonly known as the Jonestown settlement, in Guyana, Close to 1,000 people, including around 300 children, died in the settlement after American cult leader Jim Jones coerced the collective consumption of cyanide. D’Aguiar focused the novel on a child, Trina, and her friends who lived hungry in a barrack-like setting. D’Aguiar reveals the horrid conditions children were forced to live in through a scene in which Ryan, another child, steals a loaf of bread that the children eagerly devour. After finishing, D’Aguiar read six poems from his collection Translations From Memory published in 2018. Each poem touched on the importance of the past and black individuals’ experiences. While all six poems offered valuable perspectives, the reading that stole the night was an excerpt from a new novel D’Aguiar is working on entitled “Bullet.” This short section was published in the literary journal Ambit. This new piece is centered on the 2007 Virginia Tech Shooting, during which D’Aguiar was a professor at the university. The piece is inspired by Erin Peterson, a student D’Aguiar had in one of his classes, who was shot by the shooter. What is extremely unique about the piece is that D’Aguiar told Peterson’s story through the objects in which she interacted with before the shooting, the main one being the bullet that eventually kills her. Something changed in the air as D’Aguiar read “Bullet.” All his work seemed to become more real to the audience because mass shootings occur so frequently in today’s America. D’Aguiar explained that trauma in history and current events gives him a reason to write. Professor of English Maria Lima echoed the importance of using literature and writing as a way to recreate violent moments in history. D’Aguiar asserts that his work will never be done since trauma is engrained into the past and present. “I don’t think it’s over,” D’Aguiar said.